The summer of 1867 was an explosive time on the Wyoming frontier. Fort Phil Kearny, located on the east slope of the Bighorn Mountains, was an isolated military post built for the protection of the Bozeman Trail. 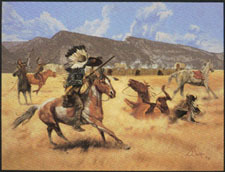 Red Cloud and the Sioux nation claimed this territory as the last vestige of their hunting ground. It became apparent, due to previous skirmishes and battles, including the Fetterman battle, that a major confrontation was imminent. Unknown to the Sioux in July of that year, troops at Fort Phil Kearny had been supplied with cartridge conversions of the muzzle loading Springfield musket, known as the "needle gun". This name was derived from the long firing pin used in the conversion. With this new rifle, 34 men comprising a wood cutting contingent, held off the Sioux for over eight hours until relief arrived. The "needle gun" was a major factor that marked the turning point of history on the American frontier. Exclusive issue of only 250 signed and numbered artist's prints at $250.00 each. Image size - 18" X 24".